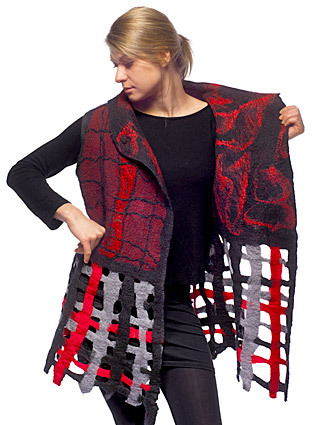 I have been creating felted garments, felt accessories and teaching felt making techniques in the Boston area since 2003. I work in felt because of its plastic nature, historic ties to the body and it’s metaphorical similarities and connections to skin. All my work is one of kind, but they may all begin as the same shape and size. I approach each piece as a unique work of art, so that even a simple scarf will possess it’s own vision. My garments and accessories adorn and beautify the wearer, while embodying the Bohemian lifestyle. I think of my work as BoHo Chic.